You are currently browsing the tag archive for the ‘Robert C. Marsh’ tag. 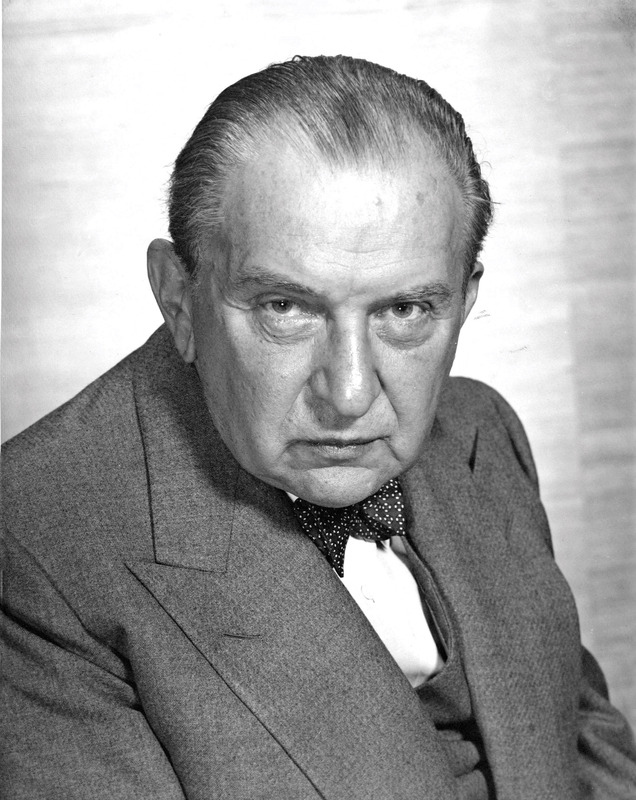 One of Fritz Reiner’s primary goals, early in his tenure as the Chicago Symphony Orchestra’s sixth music director, was to program major choral works. However, the repertory he wished to perform was, in his opinion, too demanding for the amateur and student groups usually engaged. 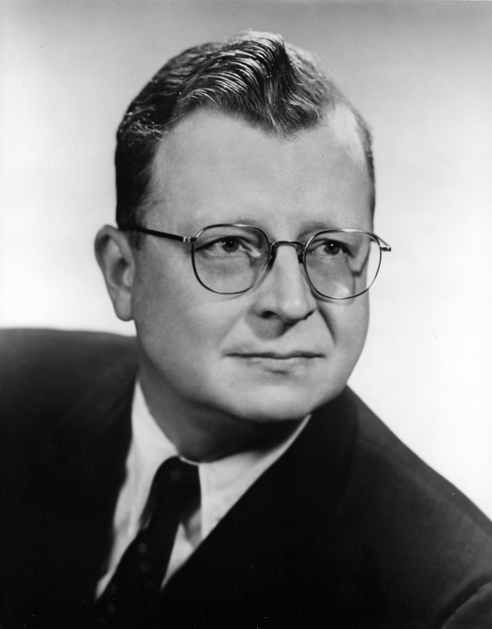 For the 1957–58 season, Reiner hoped to perform and record Verdi’s Requiem, and again he contacted Hillis. The New York Concert Choir averaged only sixty voices, and she informed Reiner they would need nearly double that in order to do justice to the Verdi. It would simply be too expensive. This impasse gave Reiner an idea. 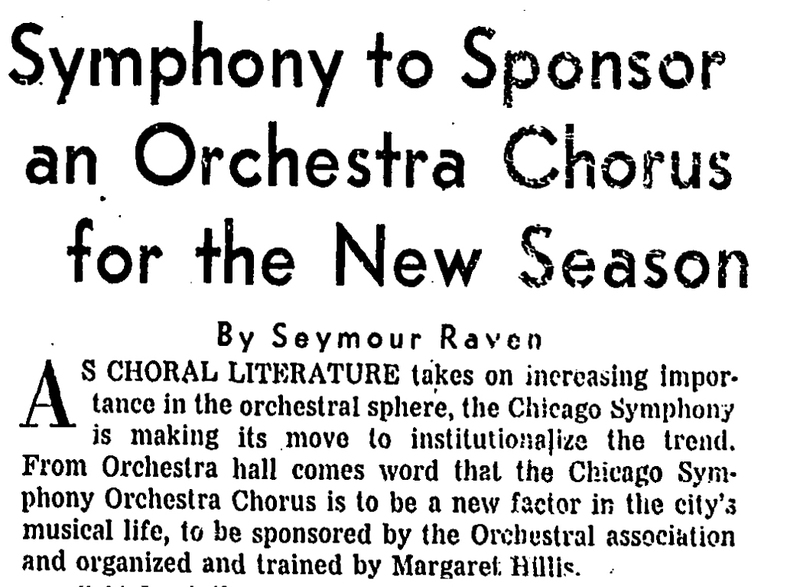 He persuaded board president Eric Oldberg to hire Hillis to organize a chorus permanently affiliated with the Orchestra in Chicago. She initially agreed to advise on how to audition a director and choristers, but Reiner insisted there would be no chorus unless Hillis herself was the director. At the trustees meeting on September 20, 1957, Oldberg reported on successful negotiations and the plan to hire Hillis was approved. 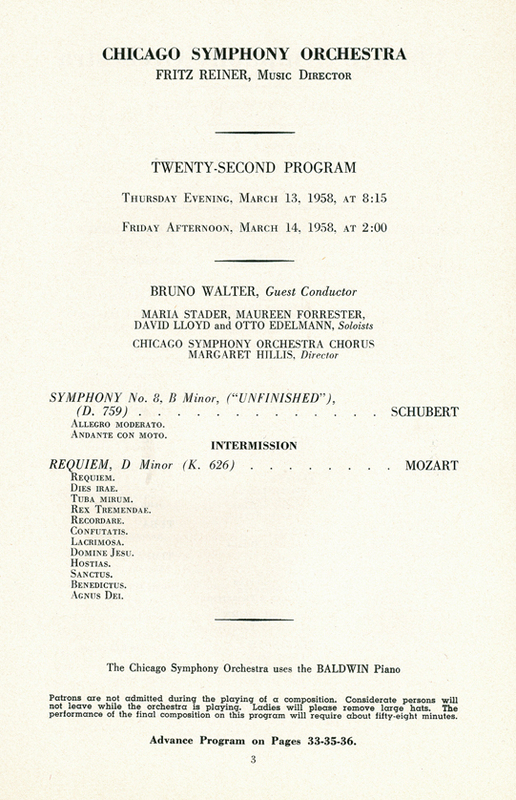 When popular guest conductor Bruno Walter informed the Orchestral Association that his March 1958 appearances would be his last in Chicago, Oldberg insisted that he should lead Mozart’s Requiem with the new chorus as his swansong. To prepare for both sets of concerts, Hillis and the Chorus began their work in earnest on Mozart’s and Verdi’s requiems, with Reiner regularly attending rehearsals. 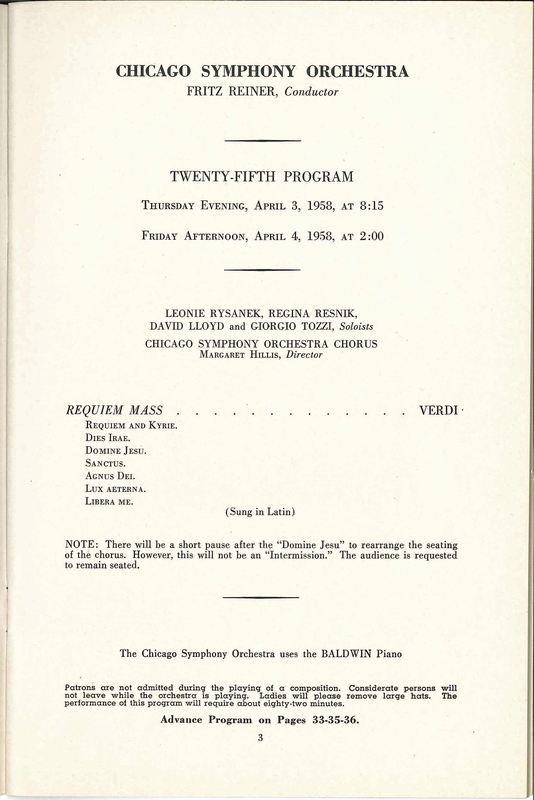 Program page for Verdi’s Requiem, performed on April 3 and 4, 1958. It was repeated the following Tuesday, April 8. 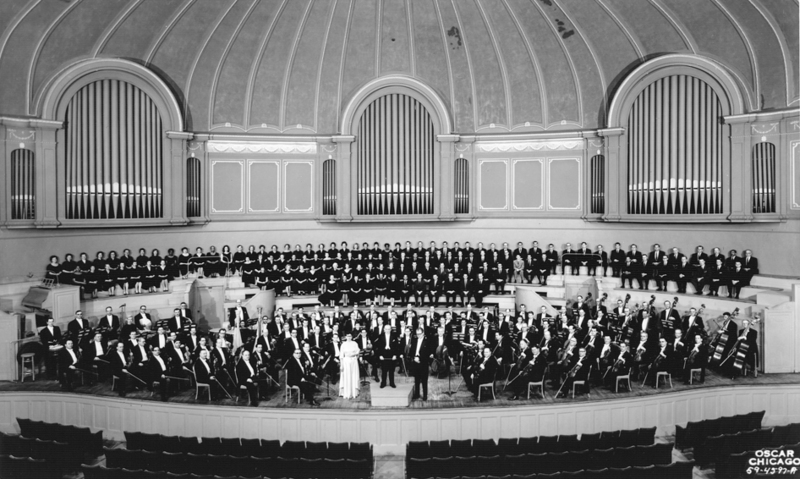 The Chicago Symphony Orchestra and Chorus onstage in March 1959. Also pictured is chorus director Margaret Hillis, music director Fritz Reiner, and associate conductor Walter Hendl (Oscar Chicago photo). 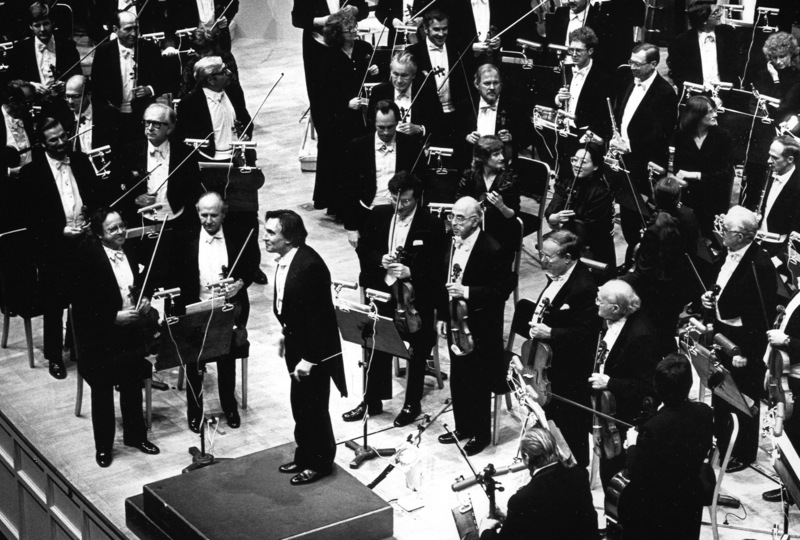 Later that season in March 1959, Reiner led Prokofiev’s cantata Alexander Nevsky. “The climactic ‘Battle on the Ice’ was approached with expansive calm and deliberation. . . . A conductor who tries to pile climax after climax into this work can never achieve the hair-raising thrust that Reiner drew from Margaret Hillis’s Chicago Symphony Chorus at such a moment,” observed Henahan in the Daily News. The Chorus “produced a pleasing sound in all voices and a more homogeneous tone than at any time since Miss Hillis began her missionary work in Chicago.” On March 7, Reiner, the Orchestra, and Chorus committed their performance to disc for RCA, collaborating for the first time in recording sessions. Margaret Hillis directed the Chicago Symphony Chorus for thirty-seven years, preparing and leading concerts—in Orchestra Hall and at the Ravinia Festival, as well as on tour to Carnegie Hall, London’s Royal Albert Hall, and Salzburg’s Grosses Festspielhaus—and amassing an award-winning discography. Following her death in February 1998, the Rosenthal Archives received her collection of papers, photographs, over 1,000 scores bearing her markings, awards (including nine Grammy statuettes), recordings, and memorabilia. Representing an exceptional and pioneering career, the collection is regularly accessed by researchers, scholars, and musicians. In June 1994, following an international search, music director Daniel Barenboim appointed Duain Wolfe to succeed Hillis. Currently in his twenty-fourth season, Wolfe continues in Hillis’s tradition, maintaining the Chorus’s extraordinarily high standards of excellence. *Due to scheduling conflicts, Reiner was unable to get the soloists—primarily Zinka Milanov and Jussi Björling—he wanted to record Verdi’s Requiem in Chicago. He, along with Leontyne Price, Rosalind Elias, Björling (in his last commercial recording), and Giorgio Tozzi, recorded it in Vienna in June 1960 with the Vienna Singverein and Philharmonic for RCA. This article also appears in the Chicago Symphony Orchestra’s March 2018 program book and here. 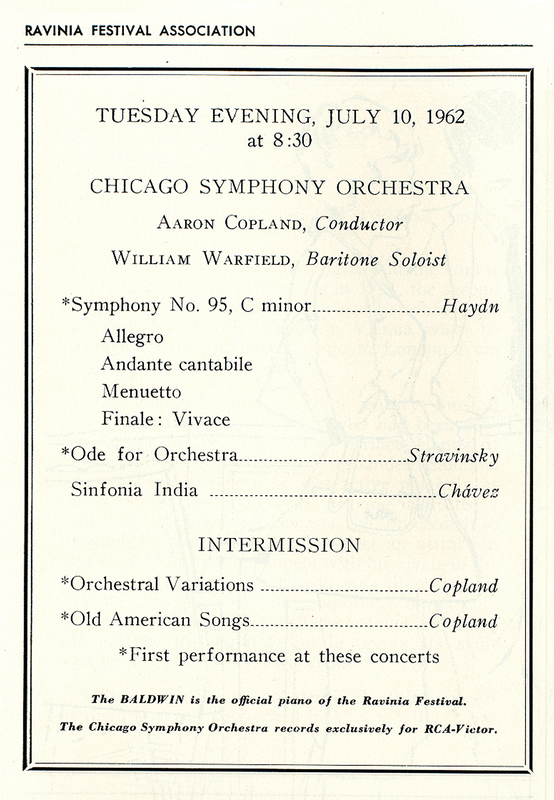 On July 10, 1962, Aaron Copland conducted the Chicago Symphony Orchestra at the Ravinia Festival in a program that began with Haydn’s Symphony no. 95, Stravinsky’s Ode for Orchestra, and Chávez’s Sinfonia india. After intermission, the composer returned to lead his Orchestral Variations and Old American Songs with bass William Warfield. 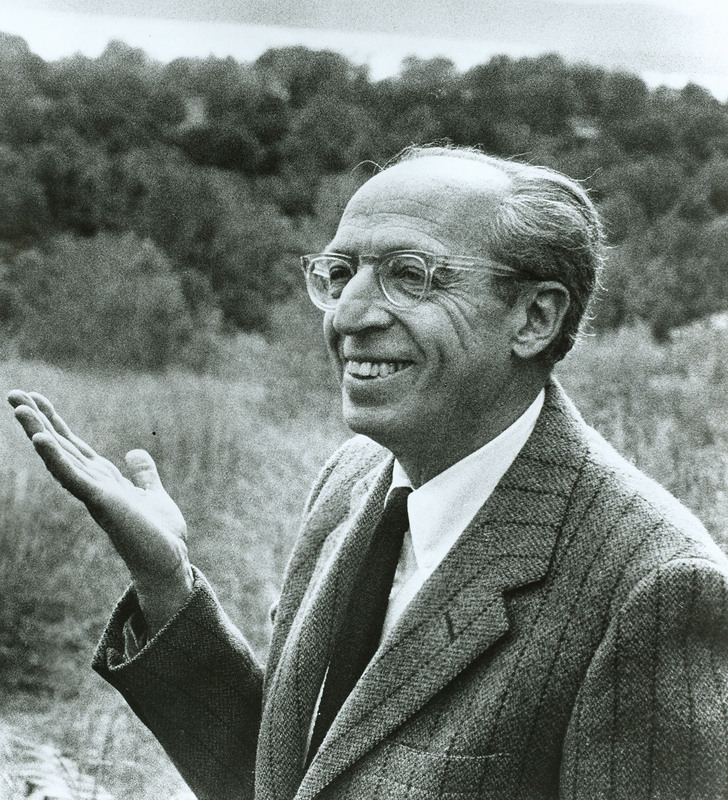 Copland had made his debut with the Orchestra at the Ravinia Festival on July 21, 1956, in a concert that had attracted over 5,000 people, despite a late-afternoon hailstorm. He led a program of his own works: An Outdoor Overture, suites from Our Town and Billy the Kid, the first two movements from the Third Symphony, and Lincoln Portrait with Claude Rains as narrator. For his debut at Orchestra Hall, the composer was soloist in his Piano Concerto on December 5, 1964, led by assistant conductor Irwin Hoffman. 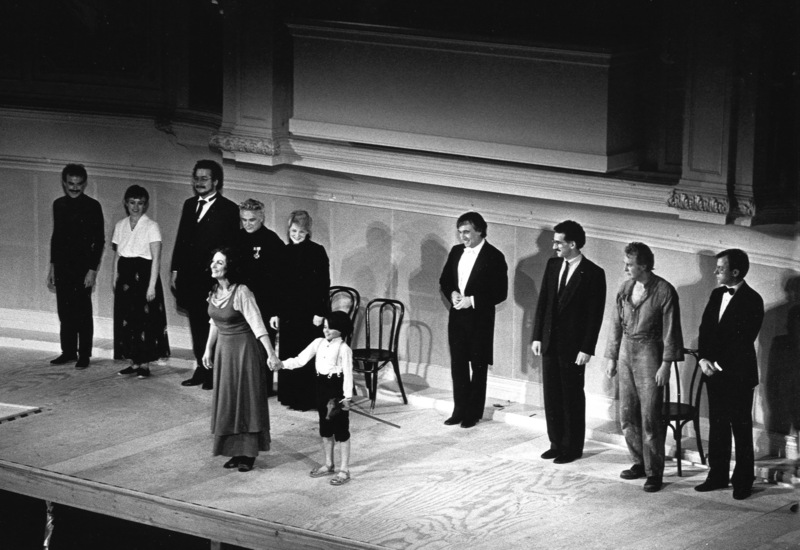 Swedish soprano Birgit Nilsson sang the title role in Strauss’s Salome with Sir Georg Solti leading the Chicago Symphony Orchestra in concerts at Orchestra Hall on December 13 and 15, 1974, and on December 18 in Carnegie Hall. The cast also included Ruth Hesse as Herodias, Ragnar Ulfung as Herod, Norman Bailey as Jochanaan, and George Shirley as Narraboth. Nilsson would appear with the Orchestra once more, on a run-out concert to Michigan State University for the gala opening and dedication of the Wharton Center for Performing Arts on September 25, 1982. She performed excerpts from Wagner’s operas, including “Dich, teure Halle” from Tannhäuser and Isolde’s narrative from act 1 and the Liebestod from Tristan and Isolde. Reynald Giovaninetti conducted. 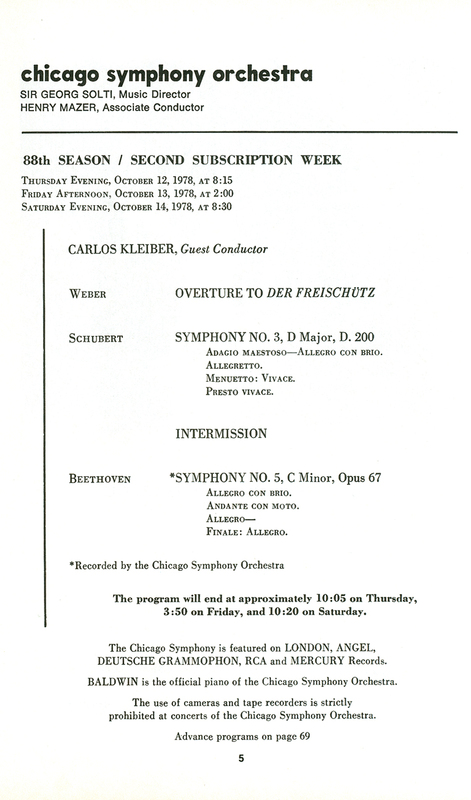 One of Fritz Reiner‘s primary goals early in his tenure as the Chicago Symphony Orchestra’s sixth music director was to schedule and perform major choral works. However, the repertory he wished to perform was, in his opinion, too demanding for the amateur groups usually engaged. 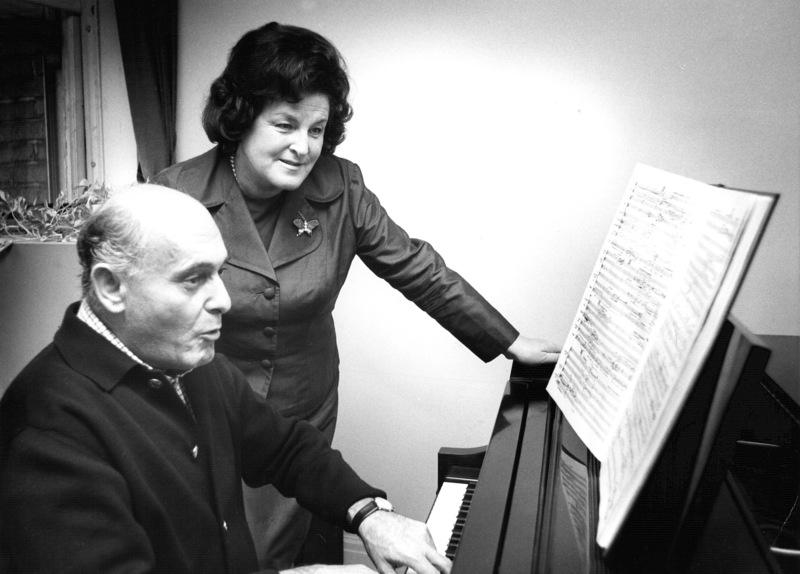 Reiner sought out Margaret Hillis—then founder and director of the New York Concert Choir—and convinced her to come to Chicago to start a chorus on a par with the Orchestra. 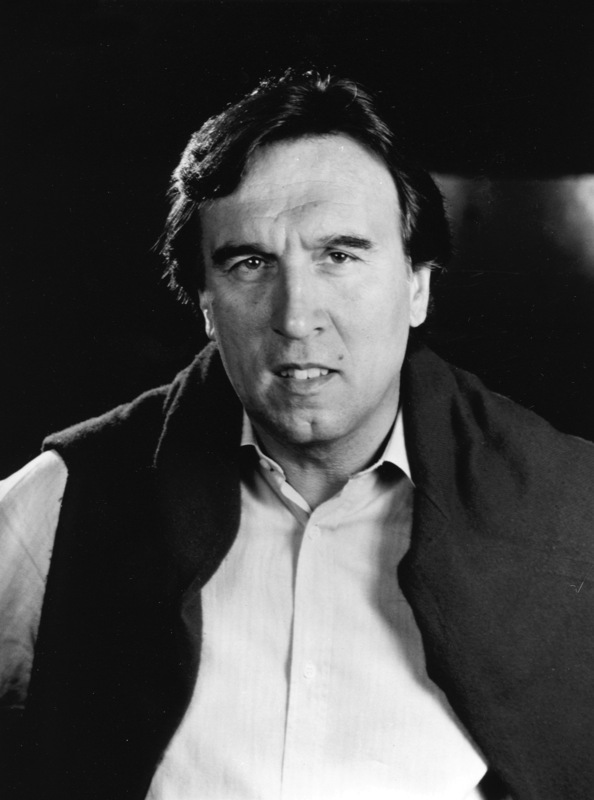 Less than a month later, on April 3, 4, and 8, 1958, the Chorus appeared in Verdi’s Requiem with Reiner conducting. The soloists included Leonie Rysanek, Regina Resnik, David Lloyd, and Giorgio Tozzi. In the Chicago Sun-Times, Robert C. Marsh wrote that “Miss Hillis’s chorus proved its virtues earlier this season. 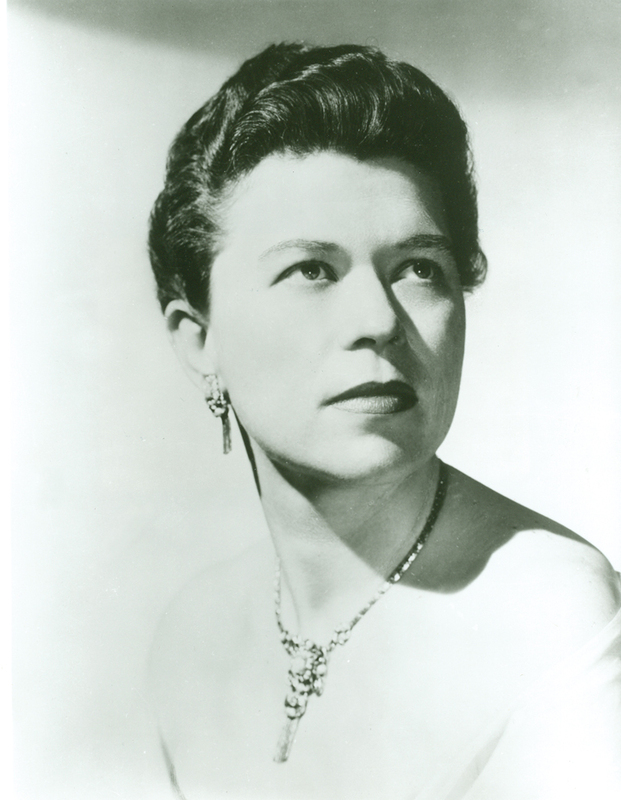 Again its excellent enunciation, reliable intonation, and intelligent response were praiseworthy.” The following season, Hillis led the Orchestra and Chorus in Honegger’s Christmas Cantata on December 26 and 27, 1958, becoming the first woman to conduct subscription concerts. 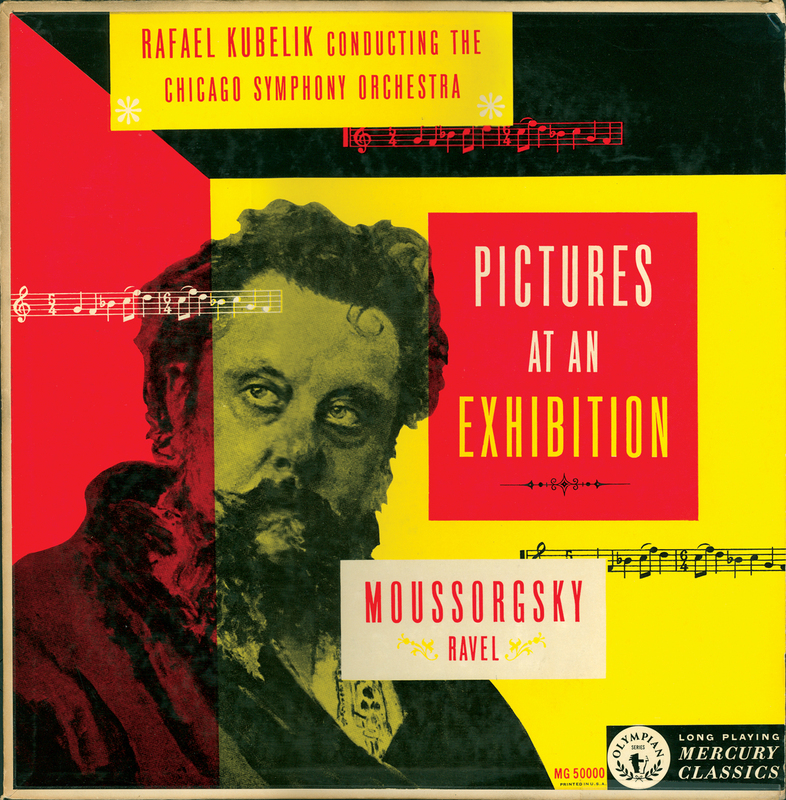 Using a single Telefunken condenser microphone—hung twenty-five feet directly above the conductor’s podium—Mercury recorded Ravel’s orchestration of Mussorgsky’s Pictures at an Exhibition on April 23, 1951, at Orchestra Hall. Rafael Kubelík, in his first season as the Chicago Symphony Orchestra’s fifth music director, conducted, and Adolph Herseth, principal trumpet since 1948, performed the opening fanfare. The recording was the inaugural release on Mercury’s Living Presence series. The Orchestra also recorded Pictures in 1957 for RCA with Fritz Reiner conducting, in 1967 for RCA with Seiji Ozawa, in 1976 for Deutsche Grammophon with Carlo Maria Giulini, in 1980 for London Records with Sir Georg Solti, and in 1989 for Chandos with Neeme Järvi. 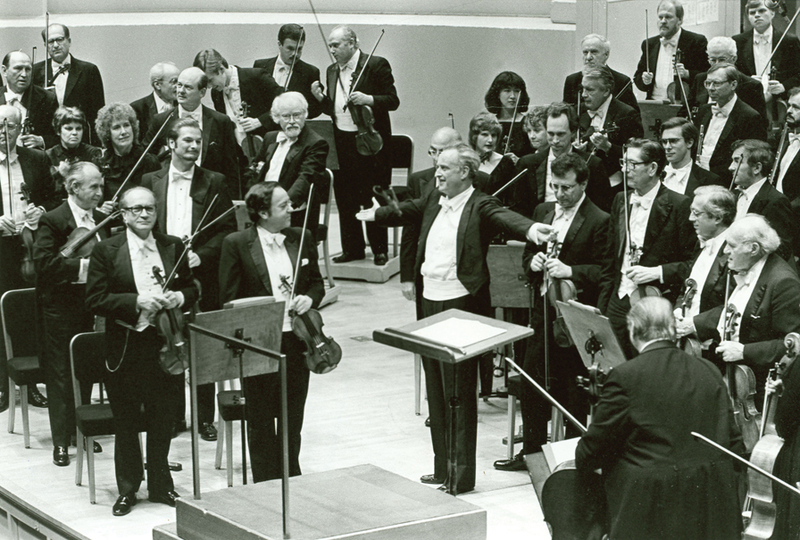 The Reiner and Järvi versions were recorded at Orchestra Hall; Ozawa, Giulini, and Solti recorded at Medinah Temple. 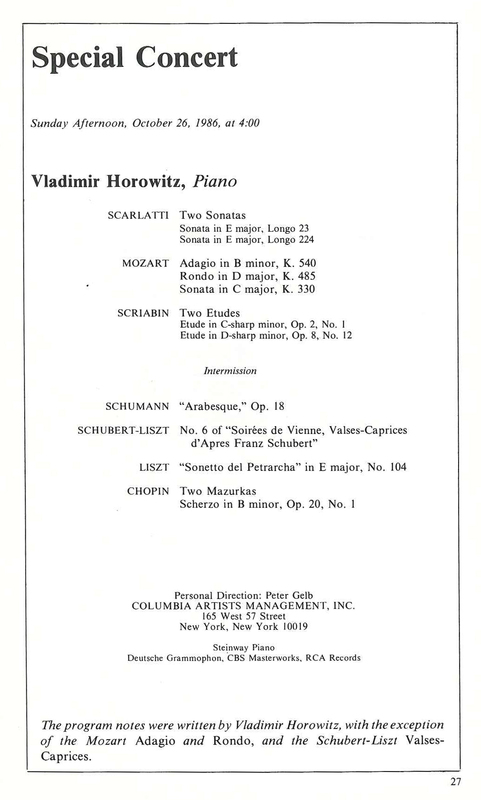 A performance video recorded at Suntory Hall in Tokyo on April 15, 1990—which also included an introduction with Solti performing examples at the piano and in rehearsal with the Orchestra—was released by London. On all recordings, Herseth performed the opening fanfare. 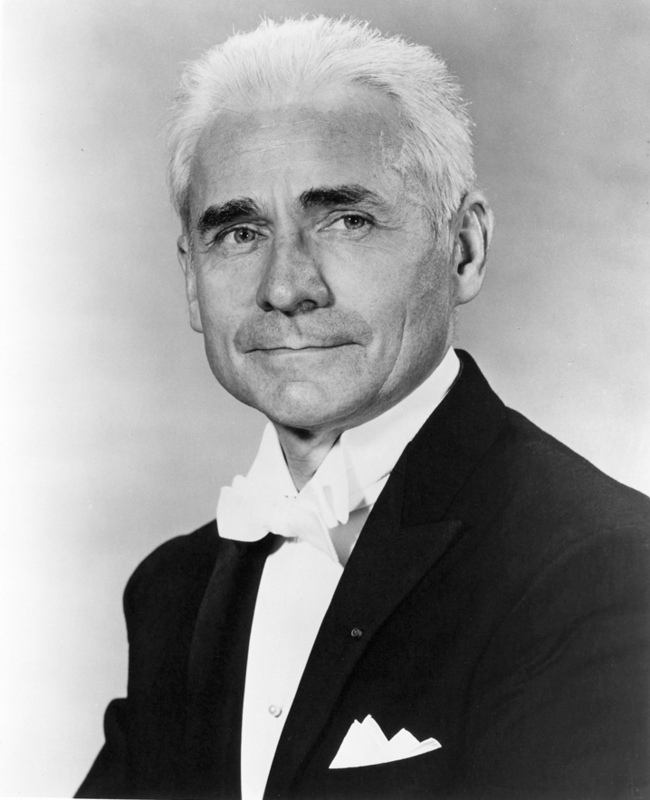 During the 1965–66 season, Jean Martinon wrote, “It is really a great honor to be leading the musical life of an orchestra at the time it reaches seventy-five years of age. 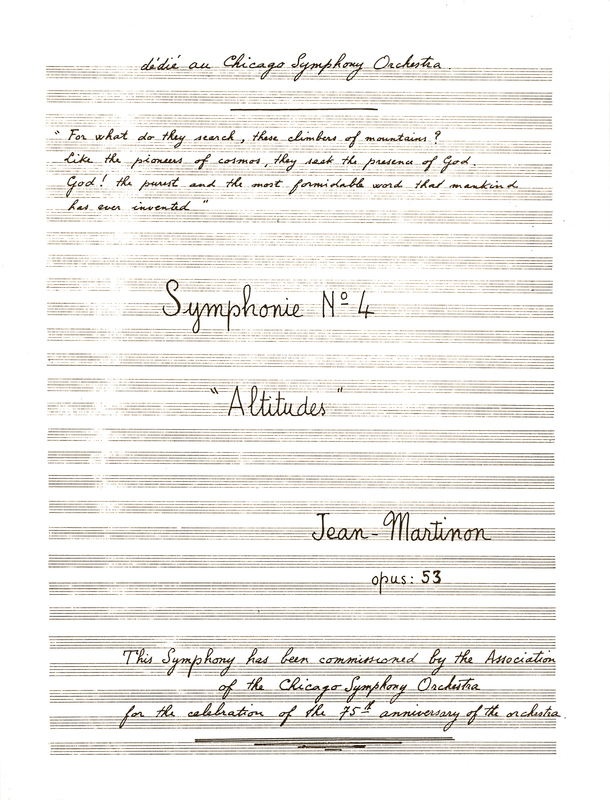 Still, a much greater honor and incomparable chance when the orchestra happens to be one of the greatest in the world.” To celebrate the anniversary, Martinon was commissioned to compose his Fourth Symphony—descriptively titled Altitudes—inspired by his passion for mountain climbing (his frequent climbing partner was well-known mountain guide and alpinist Gaston Rébuffat). 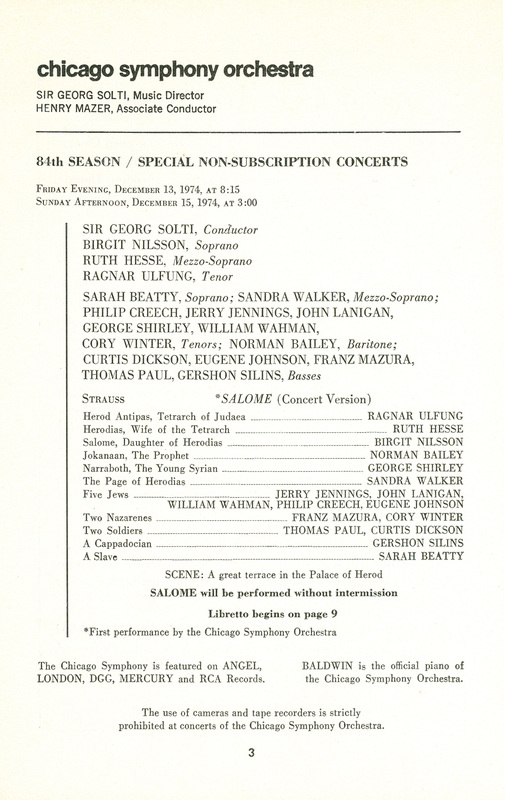 The special celebratory concerts of December 30 and 31, 1965, opened with Bernstein’s Overture to Candide followed by the world premiere of Martinon’s symphony, second music director Frederick Stock’s Symphonic Variations on an Original Theme, and the finale from Wagner’s Götterdämmerung with soprano Eileen Farrell. Nearly two years later, Martinon and the Orchestra recorded the Altitudes Symphony for RCA in Medinah Temple on November 29, 1967. 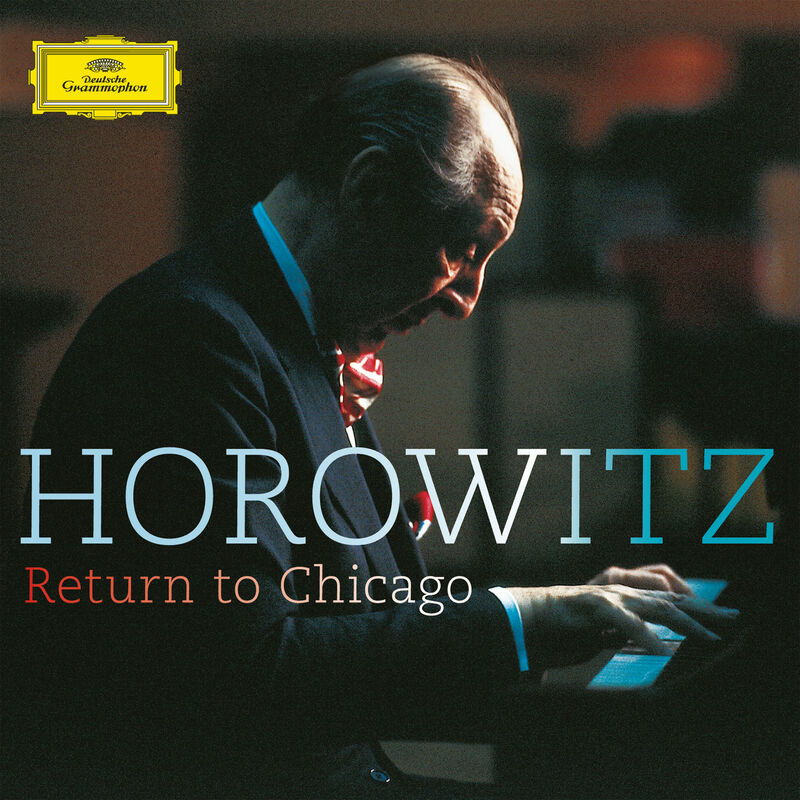 In 2015, RCA rereleased the symphony as part of a boxed set that included Martinon’s complete catalog of recordings with the Chicago Symphony Orchestra.